Pacers the unsung heroes of the Rock 'n' Roll Marathon. PHOENIX – Thousands of runners from around the country will make their way to the starting line of the Rock ‘n’ Roll Marathon in downtown Phoenix early Sunday morning to run the full 26.2 miles. Among the swarm of people stretching and preparing for the hours of running ahead, a few dark blue signs at the end of a stick will be raised into the sky. Printed with varying times on them, a select few experienced volunteer runners will be hoisting these signs above the crowd. The Rock ‘n’ Roll Marathon utilizes the help of Sole Sports Running, a local specialty running store, to assemble a team of pacesetters whose jobs are to assist participants in reaching their goals. Anywhere from 35 to 50 percent of the runners doing the full marathon are first time runners, said race organizer Judy Stowers. As a marathon runner who has taken advantage of pace teams in the past, Stowers understands the pacers’ value. As pace team coordinator, Emmet Acebedo of Sole Sports Running has the challenging job of finding suitable runners to make up the team. Acebedo stresses the importance of finding humble pace setters because they are liaisons to the sport. In the past, Acebedo would double up his duties by being both pace team coordinator and pace setter, but chose against it this year. Instead on Sunday, he will run the half marathon and monitor the progress of his team. Of the handful of pacers, one of them has run in every Rock ‘n’ Roll Marathon in Arizona since the event’s inception in 2004. For Seigo Masubuchi, running the Rock ‘n’ Roll Marathon has become an annual tradition. Masubuchi flies down from St. Paul, Minnesota, every year to flee the harsh winters back home. 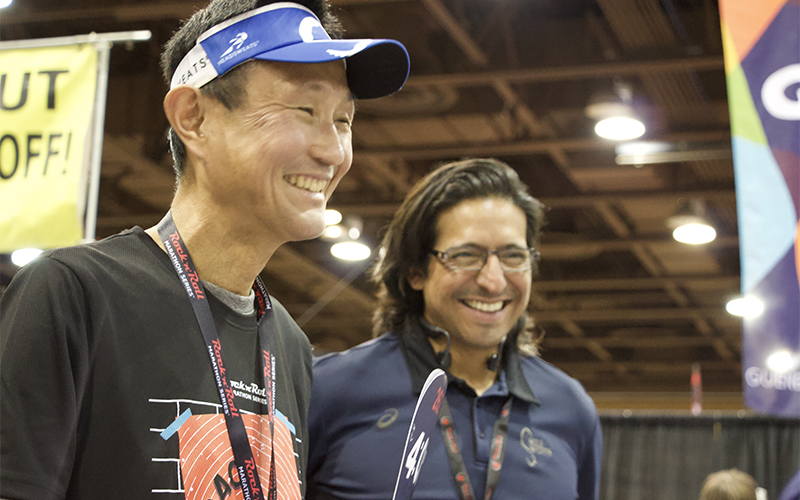 Running marathons is a lifestyle for Masubuchi who travels across the country competing. He even is a former world record-holder. In 2015, he broke the world record for fastest marathon by a costumed mascot when he completed a local Minnesota marathon wearing an 18-pound pig outfit. Although Masubuchi’s world record has since been broken, Sunday’s race will mark his 81st career marathon with at least 50 coming as a volunteer pace setter. While most runners on Sunday will have a specific goal in mind of either reaching the finish line or finishing under a specific time, the supporting cast of volunteer runners for the Sole Sports Running pace team know that their goal this weekend is to make the Rock ‘n’ Roll Marathon a memorable moment for others.